Helping patients manage an orthotic device can be challenging, but doing so in the face of uneven terrain is a balancing act between stability, mobility, and strength. 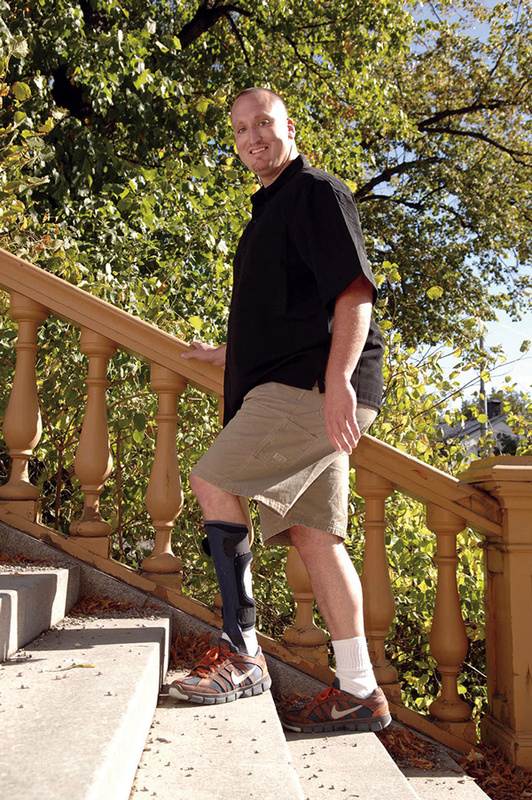 Device adjustments and rehabilitation pro­tocols can help patients avoid asymmetries and reduce the risk of falling. The term “uneven terrain” may bring to mind the most dramatic circumstances—a steep ramp in an indoor parking garage, a narrow spiral staircase, a dirt path littered with rocks, twigs, and other debris. 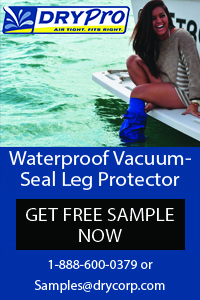 But uneven terrain can also apply to changes in indoor flooring—such as from tile to wood, or from a low-pile carpet to a plusher one—or to other flooring fixtures, such as doorway thresholds. 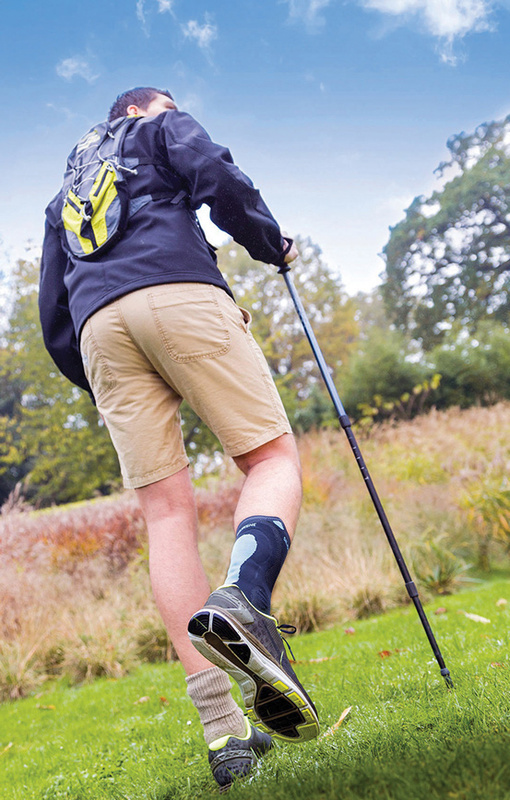 All of these examples of uneven ground can sometimes trip up an able-bodied person, so what happens when an ankle foot orthosis (AFO) or other orthotic device is introduced? 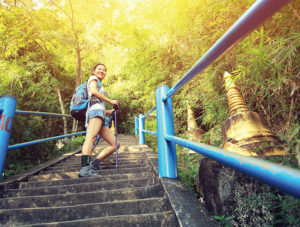 In other words, managing an orthotic device can prove challenging; managing it in the face of uneven terrain is a balancing act between stability, mobility, and strength. 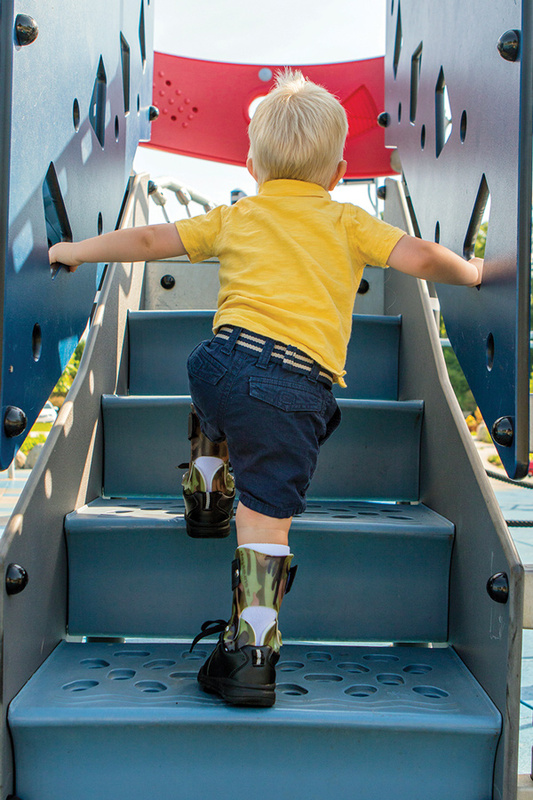 Transitioning to or from surfaces that aren’t smooth can be harder than stairs or ramps, particularly for orthotic device wearers, in part because the risks are less apparent. Photo courtesy of Arizona AFO. 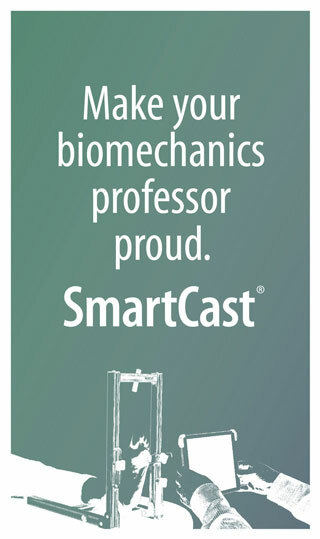 Any time there is a change in the constraints imposed on gait, the neuromuscular system must adapt, agreed Shane R. Wurdeman, PhD, MSPO, CP, a prosthetist and research scientist at the Hanger Clinic at Houston Medical Center in Texas. 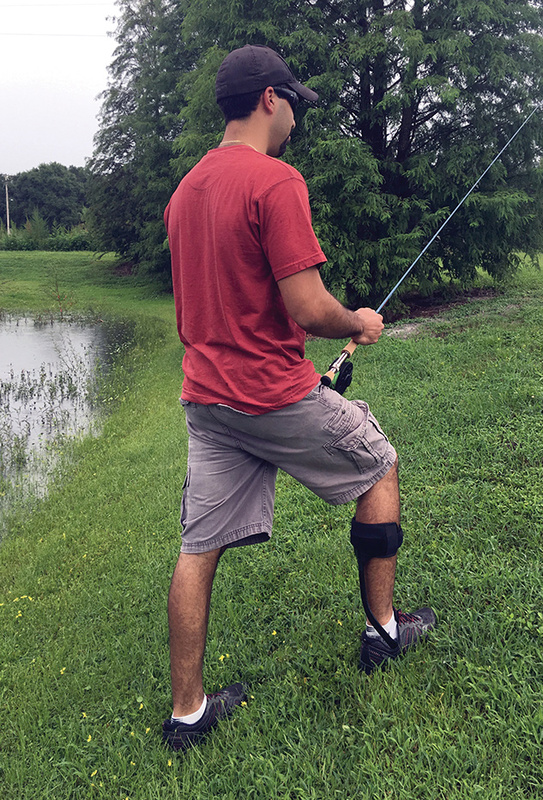 “Using a lower extremity device presents one change to the constraints, but uneven terrain, and the transition between various surface types, presents an additional challenge,” Wurdeman said. The participants walked at a self-selected speed on a level surface, a 5° ramp, and a 10° ramp. The authors reported that the ankle appeared to be the main adaptive joint when the participants walked up inclined surfaces, while the knee was more important for overall adaptation in downhill walking. Then there’s the matter of stair negotiation, which was assessed by another group in 30 healthy individuals walking on a three-step staircase.2 The participants climbed at normal, slow, and fast self-selected speeds while the researchers looked at the associations between speed and lower extremity mechanics. Peak hip flexion and extension moments increased with increasing speed, while peak knee flexion moment did not vary consistently with speed. Peak muscle activations varied consistently relative to the sagittal plane kinetics. The findings suggest the hip is primarily responsible for modulating stair climbing speed, the authors concluded. So, what happens when devices such as AFOs or other braces are introduced? One study reported that unilateral dynamic AFO users experienced less ankle motion and power generation, lower knee extensor moments, and greater hip flexion and power generation than able-bodied controls during uphill walking.3 The AFO users also exhibited asymmetries at the ankle and knee, with decreased ankle motion and power and lower knee extensor moments for the AFO limb than the unaffected limb. Still, the two groups walked at equivalent self-selected velocities and stride lengths, the authors noted. That study also compared three different AFO stiffnesses—the prescribed stiffness, 20% less stiff than prescribed, and 20% stiffer than prescribed—to determine if changing that variable might assist with uphill walking. Increasing joint stiffness was associated with increased knee flexion, but otherwise the variations in AFO stiffness had little effect on gait. Another study evaluated the effects of a unilateral solid AFO, hinged AFO, and no AFO (shoe only) on the kinematics, kinetics, and temporal-spatial gait characteristics of 19 healthy adults while negotiating stairs.4 Wearing either orthosis was associated with slower stair locomotion than the shoe-only condition, but the hinged AFO condition was similar to the shoe-only condition with regard to sagittal knee and ankle angles, moments, and powers during the pull-up phase of stair ascent and the controlled lowering phase of stair descent. Compared with the hinged AFO, the solid AFO was associated with less ankle dorsiflexion, plantar flexion power, knee flexion, and knee extensor moment during pull-up in ascent and controlled lowering in descent. The loss of dorsiflexion is particularly problematic, Lamm noted. Transitioning to or from surfaces that aren’t smooth can prove even more troublesome than ramp or stair negotiation, especially for orthotic device wearers, partly because the risks are less apparent, Wurdeman said. Changing surfaces can lead to changes in shear forces and impact forces, Wurdeman noted. For instance, the asphalt parking lot outside the shopping mall, which isn’t likely to be slippery, might have a lower shear force than the smooth, polished stone flooring inside the mall. 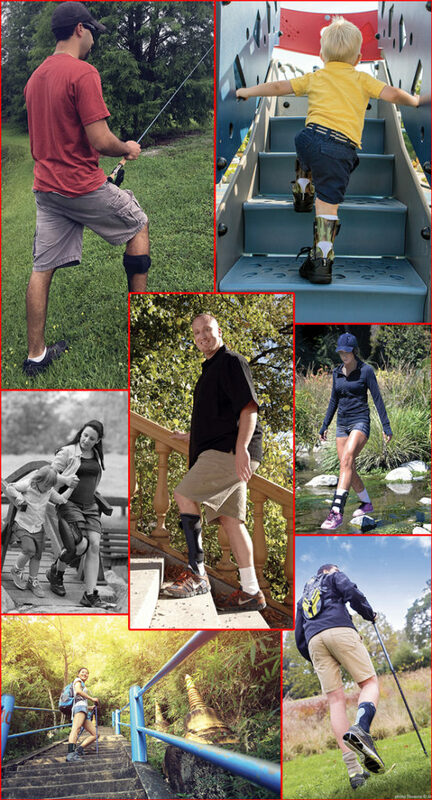 Adjusting orthotic devices to improve wearability and comfort is common practice, but device adjustments can also assist with gait, especially on uneven or nonlevel surfaces. Dynamic AFOs, which promote dynamic dorsiflexion and eversion of the ankle joint during the swing phase of gait, can be helpful when negotiating uneven terrain because the device helps to lift the foot up, avoiding the type of “catch” he mentioned earlier, Conenello said. But a dynamic assist AFO is not suited for everyone, he warned. Conenello also looks at the closure of the device—“Is the closure snug? Are additional straps needed to hold the device in place better?”—as an area that may be adjusted to improve fit and, in theory, help the patient manage with the device overall, and particularly when faced with uneven terrain. Uneven terrain can increase load on the affected side, which may be mitigated with the addition of elastic materials and bumpers to act as dampeners, Wurdeman said. But those adjustments can also have other effects. Conenello also said practitioners need to bear in mind that the orthotic device itself may not necessarily be a problem, but the change in footwear such devices often require can significantly alter gait. If a patient who is used to wearing a low-profile, slip-on shoe has to change to a bulkier one with laces that need to accommodate the brace, or a much stiffer sole, that can cause unexpected changes in gait, especially on uneven terrain. “Sometimes, it’s not the brace that feels awkward, but the shoe that feels clunky and changes the gait,” Conenello said. Julia Wilkinson, PT, also of Ken Lamm Physical Therapy, has herself experienced footwear-related hazards on uneven terrain, though she was not wearing an orthotic device at the time. Photo courtesy of Richie Brace. Conenello also noted that, either for aesthetic or comfort reasons, patients aren’t always willing to don the shoes that are best suited biomechanically for an orthotic device. He said he recommends patients start by wearing the device and the recommended shoe for an hour a day, and then increase by an hour each day until a certain level of comfort is achieved. Conenello said techniques he’s used to even out the limb lengths have included an off-the-shelf insole in the shoe on the unaffected side. Wurdeman said he’s not opposed to using a shoe lift to equalize leg length, but believes a properly fitted orthotic device on the affected leg should be a boon for the unaffected side in terms of gait symmetry and stability. Improving between-limb symmetry in terms of muscle strength can also help address limb-length discrepancies related to orthotic devices; Wilkinson suggested this be done prior to any device or footwear adjustments. The experts agreed that patients shouldn’t be left on their own when learning how to walk again with an orthotic device, and that the rehabilitation process can help prevent future issues with uneven terrain. 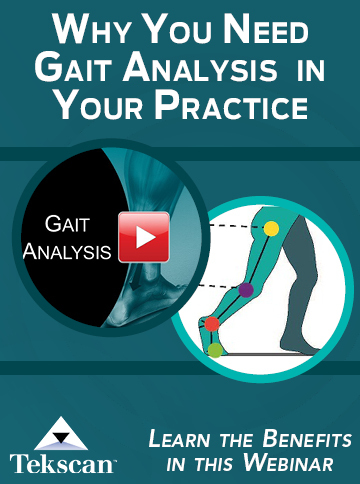 Any rehab program will start with a gait assessment, and practitioners may have to think outside the box if they are going to teach a patient to regain mastery over uneven terrain. “Clinicians need to understand that, to truly help a patient walk, we need to see them walk in different environments, not just the hard tile floor of the clinic. I am seeing many clinics now that have uneven terrain put into rooms in their facility—a strip of shag carpet or even a gravel pit,” Wurdeman said. Because some patients will feel the need to “perform” during a formal gait assessment, Lamm will often watch a patient as he or she walks into the clinic from the parking lot. Photo courtesy of Kinetic Research. Wilkinson said she asked one of her patients to meet her outside the clinic to work on walking a set of steps. But even an assessment on level ground—looking at stride length, step frequency, limping, leaning to the side, arm swing, posture—can reveal a lot about how someone is managing with an orthotic device, she noted. With regard to physical therapy for uneven terrain, Lamm and Wilkinson outlined several key aspects they focus on, starting with addressing the iliotibial (IT) band. IT band tightness may preclude the straight gliding of the knee forward during the swing phase of the gait pattern so that the affected leg may swing slightly out to the side, Lamm said. This can be a problem if a person is trying to climb stairs; rather than stepping up and straight ahead, she may swing out and wind up dragging herself up the stairs, Wilkinson explained. “It’s related to the AFO because if they are swinging the leg out to the side, the insertion of the IT band ends up over the lateral shin muscles, and the IT band is so taut that when you try to stretch it, it may get irritated,” Lamm said. His group works on strength­ening to avoid this situation, specifically a side-stepping exercise to strengthen the affected hip and lateral leg muscles. Wilkinson emphasized the importance of hip flexor flexibility for the swing phase of walking—tight hip flexors may lead to a limp or problems with toe-off—as well as strengthening the core, knees, and ankles. Both said building endurance is also paramount. A patient in an orthotic device may be able to get by with an awkward gait for 12 feet, but what happens if he must walk 200 feet? Their preferred tools include resistance bands and isometric exercises. The latter are particularly effective because there’s no joint agitation and they are able to “super-strengthen,” Lamm said. Fatigue and limited ankle eversion both contribute to the risk of falling, especially on uneven terrain, Lamm noted, but resistance exercises and therapy bands can increase strength and endurance. Exercises that emphasize repetitive eversion also can help strengthen the ankle, Wilkinson noted. For Wurdeman, neuromuscular coordination is key for making sure patients can effectively respond to any terrain they come across. Hansen AH, Childress DS, Miff SC. Roll-over characteristics of human walking on inclined surfaces. Hum Mov Sci 2004;23(6):807-821. Lewis J, Freisinger G, Pan X. Changes in lower extremity peak angles, moments and muscle activations during stair climbing at different speeds. J Electromyogr Kinesiol 2015;25(6):982-989. Haight DJ, Russell Esposito E, Wilken JM. Biomechanics of uphill walking using custom ankle-foot orthoses of three different stiffnesses. Gait Posture 2015;41(3):750-756. Radtka SA, Oliveira GB, Lindstrom KE. The kinematic and kinetic effects of solid, hinged, and no ankle-foot orthoses on stair locomotion in healthy adults. Gait Posture 2006;24(2):211-218.